London, the capitol of England, is a huge metropolitan area, impossible to see in one visit. This travelogue will be a gathering of thoughts and experiences from several trips. Who knows what we will discover as we turn the next corner! London has long been a center of life on the Isle of Britannia. The city sits on the Thames, a tidal river that leads to the very heart of England. In the ancient days, it was a strategic location because there was a natural ford, which made it possible to cross the river. The Romans built Londinium, and this is where the recorded history of London actually begins. The Romans built a bridge over the Thames and set up a fort. Some of the early Roman settlement has been unearthed during modern construction. Roman walls can be seen amidst the chrome and glass of high rise buildings. Roman London was actually twenty-seven feet below modern London. In the nearly two thousand years since the Roman empire ruled the world, buildings have collapsed or burnt, living a pile of rubble which was not removed but built upon. During one of our trips, we passed over a bridge, and the tour guide told us to look down. Below us was the one place in the city where the original level of Londinium was still visible. The best way to see the city is on some sort of tour. We’ve been there several times on bus tours that take us around the city. Driving in London is even worse than driving in England. The incredible amount of traffic and confusing system of one way roads makes public transportation or chartered trips the best means of getting around the city. Since London has long been the center of life in the United Kingdom, from politics to trade to the seat of the monarch, there are many historic buildings to visit. One Sunday we took a bus trip to London. The whole family went to enjoy the sights and sounds of London. We had the greatest tour guide, who knew all the gossip and all the stories. We spent the day driving in circles, passing the same places over and over again. We passed by the major sights, stopping for a brief time at a few. Our first stop was St. Paul's Cathedral. Since it was Sunday, we could not tour the cathedral, but it is an impressive structure to look at from the outside. Our next stop was at St. James' Palace. This is where Prince Charles lives, and it is used for some State functions. We were able to watch the changing of the guards. We watched as the old guard left St. James' Palace and headed up the Mall toward Buckingham Palace. Our guide ran (yes, I mean ran) us to the other side of St. James' Park to the dorms of the guard. We had the perfect position to get shots of the new guard as they left the dorm area to head to Buckingham Palace. I was a bit disappointed because the guards were wearing their winter coats, which were a rather drab gray color. The guards marching in formation made an impressive sight. We were given some free time to try to see the ceremony outside Buckingham Palace, but there were too many people to see anything. Following the ceremony, we found the meeting place, and our guide took us down the mall toward the Marble Arch. He told who resided in each house along our way. As we moved back toward our bus, we were given the opportunity to get our picture taken with one guard who was on the gate of St. James' Palace. We were cautioned not to touch. We drove around some more, getting a view of the rest of the royal district. At one point, we went through a small neighborhood. It had very tiny roads, and parking on both sides. We had to all take a deep breath to get the bus between two cars. As one guy said, "You are pretty close when you set the car alarm off.” We passed by Kensington Palace, where Princess Di lived, as well as Princess Margaret. After lunch we were driven around the business and shopping districts. We saw Harrod’s and many of Princess Diana’s favorite shops. Then we crossed the Thames and viewed some landmarks on the South Bank, such as the M16 building, Lambeth Palace and the New Globe Theatre. The Globe is the theatre that was originally built by William Shakespeare for the performance of his plays. The original has long since disappeared, but it was recently rebuilt. You can see modern productions of the bard’s greatest hits throughout the year. After a few more passes through the business district, we finally stopped at the Tower of London for a few pictures and some souvenier shopping. We didn't have time to visit inside the Tower, but we did walk up onto the Tower Bridge. Another bus trip to London was with Vicki’s Brownie Girl Scout troop. We began the day very early, traveling to London on a bus singing cute Girl Scout songs, over and over and over again. We went to Hampstead Heath, which is a suburban area in the middle of Metropolitan London. Metropolitan London is a very large area, covering 650 square miles. It is divided into 33 boroughs. Our first stop for the day was the Pac Lodge, a World Centre for Girl Scouts. Girl Scouts from all over the world can use the lodging facilities when they are visiting London. They even have opportunities for older scouts to stay at the centre and 'work' for their room and board. It's an awesome opportunity for young adult women to do some foreign study, inexpensively and safely. We continued our trip with a tour of London City. The girls were working on several special patches, which are only available to girls living in the United Kingdom – American History in London and Children’s Literature and Nursery Rhymes. A lovely lady was our tour guide throughout the day. She directed our bus driver through the incredible. Our guide took us to some really interesting sites. We saw the US Embassy, the home of President Adams (whose father was an ambassador to London), statues FDR, Eisenhower, George Washington, Abraham Lincoln. We saw the home of John Rolfe, the man who married Pocohantas. We needed to see London Bridge, but since it is actually near Lake Havasu, Arizona, we looked at a bridge located where London Bridge used to stand. We saw the home of the Darling Family. Mr. Darling wrote the story of Peter Pan. We saw 221b Baker street, the legendary house of Sherlock Holmes. The marker is on one house, but the actual site is almost a block away. The building they have marked is newer and they made it look like Sherlock could have lived there. Of course since Sherlock was a literary figure, he didn't really exist anyway! We also saw a plaque placed in honor of John Newberry, the children's writer who wrote Mother Goose's Nursery Rhymes. The Newberry Award is given every year for excellence in Children’s literature. We lunched in the shadow of the Tower Bridge, across the Thames from the Tower of London. We enjoyed a grassy park, sunshine and people watching. 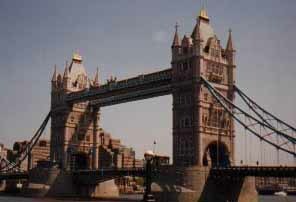 We watched the tour boats as they cruised up and down the Thames and the red double-decker busses crossing the Bridge. The afternoon was spent in the comfort of the Dominion Theatre. We saw Beauty and the Beast live on stage. It was a wonderful show, the girls really enjoyed the singing and costumes. When the Beast turned back into the prince, it was a truly magical moment. The girls were given a back stage tour. They were able to see the set upclose and to feel the costumes. I found a great deal of humour in the choice for Gaston, the dumb fool who desires Belle to be his wife. He was the only American actor to be part of the show. Our group went to the Fashion Café for dinner. This is the eatery owned by those famous supermodels. It was 'interesting'. During the dinner, we were treated to a live fashion show, which was not entirely appropriate for our pure little Brownie Girl Scouts. The clothes were decent, but the performance was a bit racy. The food was good. The girls were able to play on the catwalk, pretending to be models. We did not see anyone famous. Picadilly, the location of the Fashion Café is known for its eateries. We passed several famous restaurants, such as Planet Hollywood. One of the things I was determined to do while living here in England was to have tea at the Queen’s house. The State Rooms of Buckingham Palace are open for two months a year, while the royals are gallivanting around the country, spending time at their other homes at Sandringham and Edinburgh. 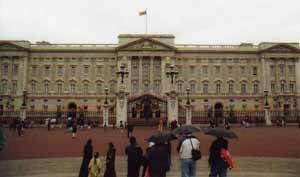 Located in the very heart of London, Buckingham Palace has six hundred rooms. On the tour were only able to see fifteen of those rooms. The tour was of the area of the palace that is used for state dinners and receptions. Each room is filled with masterpieces by famous painters, furniture that are real antiques, porcelain vases and sculpture. As an artist, I was in awe of the paintings by people like Rubens and Rembrandt. The walls are covered with silk and tapestries; the staircases are made of marble with guilt bronze balustrades. As I walked through the rooms, I wondered if the queen truly appreciated what she has. They don't use that part of the palace very often, but I wonder if she ever just wanders there to enjoy her paintings. I think it would be sad if they just hung there, only to be enjoyed at some party. It was interesting to look at the paintings of the past kings and queens of England. Their portraits helped put some of the history I have learned into perspective. Did I have my tea with the queen? No, but I did purchase a box of English Breakfast tea in the shop after our tour! The trip to Buckingham was with a tour group. In the afternoon, we had free time to visit London on our own. We went to Oxford Street, the heart of the London shopping district. We ate at the only Wendy’s for 3000 miles, and shopped at the biggest toy store I’ve ever visited. Hamlins is six stories high, with lots of toys to play with and purchase. Next we went to Picadilly, once again seeing Planet Hollywood, the Fashion Café and other leisure spots. We could not resist a trip into Segaworld – six floors of video games. The admission is free, but the designer was smart. There is no way out of the place without passing every single video game available for play. You take huge escalators to the very top floor, then move over each level until you reach the bottom. There are rides and food concessions throughout. We let Zack pretend to play one of the games, and that was enough for him, so we managed to leave with our wallets still intact. There are so many other places to visit in and around London. Our latest trip to Oxford Street was shortly after the New Year, and we found sales galore. The pavements were packed with other shoppers out for the best deals. I bought a ball gown for under £50. We ate at Garfunkle’s. We wandered the streets in search of a tube station when the one we wanted to use was closed. The Christmas lights were still up and glowing. It was a very rainy day but we had so much fun, just spending the day together. Each trip to London is a unique experience. Visit the rest of our London pages for stories about Westminster, Hampton Court and St. Paul’s. Find out what it is like to be on the tube at rush hour. Pages will be added as we make more trips to the City on the Thames.